For me personally, the biggest discovery was not the fact that the first programmer in history was a woman, but that it was Lord Byron’s daughter, Augusta Ada King, Countess of Lovelace. Lord Byron is well known not only for his talent but also for his controversial lifestyle. An article by BBC quotes a contemporary, who described the bohemian poet as: “mad, bad and dangerous to know“. In 1815 he married Annabella Milbanke, their marriage was very unhappy but resulted in Annabella giving birth to Byron’s only legitimate child, Ada. A year later, in 1816, the couple separated and the poet, pressured by his scandalous affairs, debts and a failed marriage, left England to never return. He travelled around Europe, hung out with Percy Shelley and his wife Mary Shelley (who wrote Frankenstein), had several romances and wrote some of his most famous poetic work, such as, Don Juan. Lord Byron died of fever in 1823, while fighting for Greek independence from the Ottoman Empire. His death was mourned throughout Britain and his body was returned to be buried at his ancestral home in Nottinghamshire. 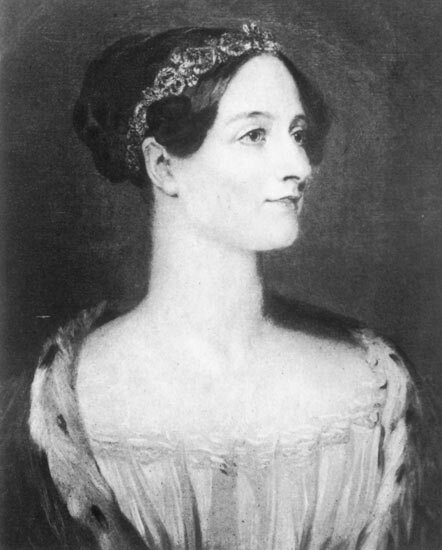 Ada Lovelace, the first programmer in history. Ada was only a few months old when her father and mother separated. She has never met her father, but it was obvious that she has inherited his talent to an extent. Ada’s mother, Lady Byron, who has had mathematical training (according to the Computer History Museum, Lord Byron used to call her the ‘Princess of Parallelograms’), was afraid that her daughter would take after her father and go “insane”. So the girl’s education was primarily focused on mathematics, logic and science – the subjects that her mother considered to be the opposite to poetry. However, Ada developed an interest in her father and described her own approach as “poetical science”. The girl was very smart and talented, which was obvious when she produced a design for a flying machine at the age of 13, in 1828. Her mathematical education or upbringing wasn’t conventional for an aristocratic girl at the time, in fact, according to Biography.com, her mother was quite extreme in her methods. For example, she would make Ada lie still for an extended period of time, as she believed that this way the girl would develop self-control. In 1833, aged 17, she met the man that would change her life, Charles Babbage. No, unfortunately, there is no romantic story here, as two years later Ada married William King, a man 10 years older than her, who inherited a noble title in 1838. This way Ada became the Countess of Lovelace. Ada’s and William’s marriage seemed to have been a happy one, where William allowed his mother in law, Lady Byron, to direct their life and fortunes (meaning that everyone was peaceful). The couple had three children, loved horses and socialized with the brilliant minds of the time (including people like Charles Dickens). The Earl of Lovelace was mostly supportive of his wife’s scientific interests. According to the Computer History Museum, science wasn’t officially considered a profession at the time, so Charles was known as a “gentleman scientist”: “an independently wealthy amateur well able to support his interests from his own means”. His mainly was mathematical, but his field of interests was extremely wide, so until this day some people call him a polymath. Ada and Charles at a party in 1833, when Ada was just 17 years old. At the time Babbage was working on the “Difference Engine”, an elaborate calculating machine. He demonstrated Ada a small working part of it, which fascinated the young girl. Charles became her mentor and a lifelong friend. Both of them had unconventional personalities and shared a passion for science. They did research together and were extremely fond of each other, in fact, according to a source, Babbage often described Ada as “The Enchantress of Numbers”. Without finishing the Difference Engine, Charles planned to work on a new and a more complex machine, the Analytical Engine. Due to sponsorship problems, the project was financed from abroad. Soon after that, an Italian mathematician, Louis Menebrea, published an article about the machine, which Ada translated from French. Since Ada knew so much about the machine, Charles Babbage asked her to expand it with her own thoughts and ideas. When her work was published in an English science journal, it was three times longer than the original text. Ada’s theories included thoughts on how codes can be created to process letters and numbers, as well as on repeating a sequence of instructions, known as looping nowadays. For that work, Ada is considered to be the first programmer in the history of computer science. However, the article got little attention while Ada was alive and her later work wasn’t as successful. The Countess of Lovelace died aged 37, from uterine cancer. She was buried next to the father she never knew. The Analytical Engine was a step towards the modern day computer, however, it was never completed. Another branch of inventors dominated the field and Charles’ and Ada’s work was almost forgotten for some time. For this reason, it is often overlooked nowadays. However, a couple of decades later, Alan Turing, the inventor of the Enigma machine and another father of the modern-day computer, found Ada’s notes critical to his work. And around half a century later, a programming language was named after Ada Lovelace, as a sign of respect for her and her work. I find it so inspiring to hear about strong female role models in Computer Science, especially when there is so much history involved. Once you put things into context, a whole new world opens up and you start visualising people of the time. I don’t know if you have watched a movie called “The Imitation Game” if you haven’t – I really recommend it (and not only because of the actors). It is absolutely fantastic and gets you to understand what first computers were like and to feel the atmosphere of the times. I hope you enjoyed Ada’s story, another post about a female role model will be coming soon! Great work about Ada Lovelace! When I first read about Ada Lovelace (some years ago) I coudn’t believe it. Not only because she was a female but also one of the first people to discover programming and how to use machines to do the task. She had a tough childhood, but maybe that was the reason why she became so good at math and interested in machines. She was a strong and smart woman! Thanks for this wonderful work, thumbs up!